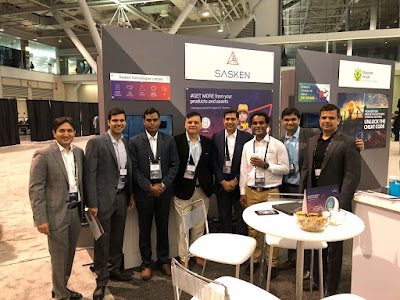 Sasken Technologies Ltd., (formerly Sasken Communication Technologies Ltd.), a leading product engineering and digital transformation solutions provider, recently sponsored and participated in LiveWorx 2018 held from June 17 to 20, in Boston, USA. At the event, Sasken who is a Certified ThingWorx Ecosystem Partner, showcased its expertise in Digital Services and demonstrated its Asset Performance Management and AR-based Field Force Productivity solutions for Industrial IoT (IIoT). Increasing customer economic value, personalization expectations and need for smart, connected products are forcing companies to re-think their next generation of industrial products and traditional methods of manufacturing. The focus is to produce dynamic and customized products for every consumer at faster rates with lower production costs. Sensor driven IoT technology is enabling industries to face challenges in their physical to digital journey. Industrial manufacturers across the globe are now looking to get real-time view of operations, which will help them make quick and informed decisions thus increasing operational efficiency and productivity. "Digital is a business transformation enabler for our customers in the Industrials, Manufacturing, and Transportation verticals,” said Raman Sapra, Executive Vice President and General Manager – Digital Services, Sasken. “Sasken’s strategy is pivoted around building Digital capabilities in the B2B segment to drive the Digital transformation journey of our customers. We have built strong practices in the form of Digital Platforms, Mobility, UX/UI, IoT, AR/VR, Analytics, and Blockchain. Through these capabilities we enable our customers to implement Digital Transformation solutions that help them create new business models, deliver exceptional customer experience, and achieve superior levels of operational efficiency. At LiveWorx 2018, we were delighted to showcase our comprehensive set of capabilities in the Digital space to customers and partners," he added. Sasken’s has enabled customers to increase productivity, reduce downtime, drive profits, and achieve enhanced end-user satisfaction. It has partnered with customers to address complex needs around IIoT platform development and roll-outs, modernizing legacy applications, cloud enabling automation and control systems, enhancing field force productivity, and building intelligence across machines, devices, and plants.